Blowing dust off boxes of holiday decorations and untangling a string of lights, an Eichler owner at this time of year might find cause to wonder: What is the perfect decoration for a mid-century modern home? Looking around at all those massive windows could be a clue. It doesn't take three wise men to figure out that Eichlers are perfect for holiday window painting in a way other homes just can't match. Ready to let your walls of glass sing out with Christmas cheer? 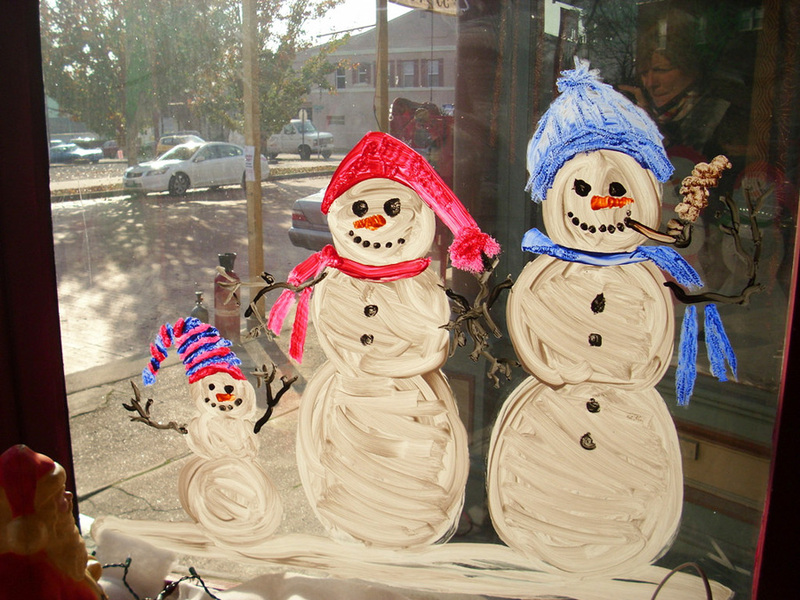 "In my opinion, the snow scenes look the best," remarks Tom Taylor of Window Painters, one of two veteran Bay Area sign and window painters we spoke to about the window-painting practice. Make no mistake—this is not a low-cost celebration of the holidays. Hiring an artist to paint a decent-sized window or glass wall costs hundreds of dollars—even a thousand or more, especially if ladder work is required. Whether you're putting on the Ritz for holiday entertaining or just celebrating the season and the year past, however, you can't beat cheerful, artistic window décor for bringing smiles to December faces. 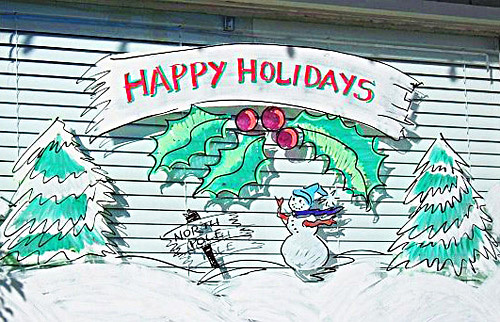 "The reason I love it so much is everybody's happy with what you do when you're a Christmas window painter," said Marin-based Franis Engel, who has painted windows for 40 years since training at California College of the Arts in Oakland. "I've been doing it my whole life." "Some people have me decorate for a party," Engel says of her clientele, adding with a smile, "The advantage is, it doesn't take up any floor space." Oftentimes, Engel will paint a business window for trade, admitting, "I tend to do work for restaurants I like to eat at." Although both painters do far more windows at businesses than homes, Taylor said residential window jobs frequently have special rewards because "the kids are there." 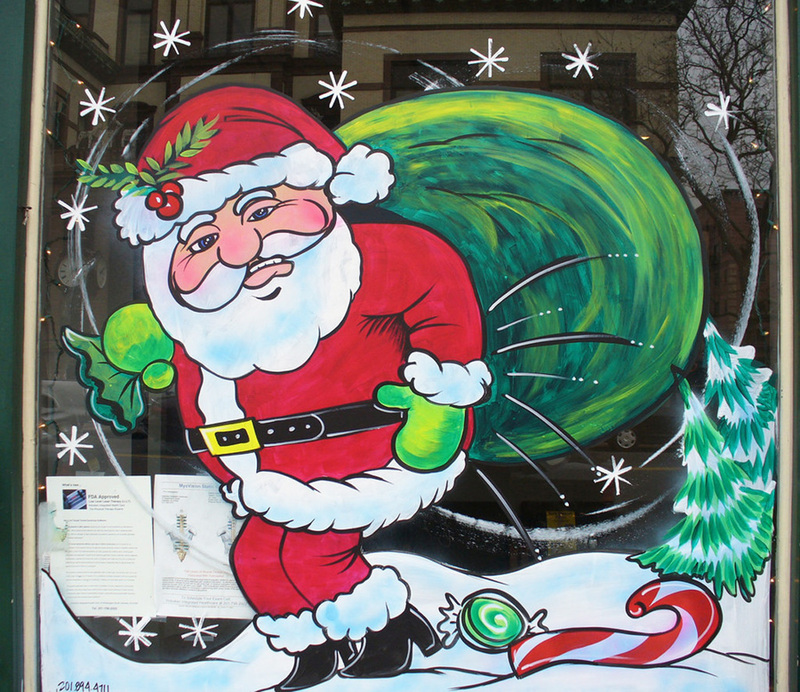 "The kids are the most fun thing about [painting] windows period, because they see it and they just 'lose it,'" the Concord native says with a laugh, quoting one particularly suspicious tyke: "'Is it Christmas? Well, it sure looks like Christmas to me.'" Taylor said homes are more challenging than business windows for several reasons, one of which is that homeowners "can get so emotional and so serious." "They're usually big houses, and they want something up high," he added, noting that many customers want six-color jobs. "So, that means six trips up the ladder."